Amy Flurry leads her DIY PR Workshop in the Greenhouse! Amy Flurry's DIY PR Workshop in the Greenhouse was a hit! This past Thursday night, designers, artists, and entrepreneurs from North Carolina's Triangle and beyond came out for expert advice about netting great press for creative businesses! Imparting the wisdom gained through her extensive career as an editor and contributor to some of the biggest publications in print and online, Amy's DIY PR Workshop was a great jumping off point for folks interested in spreading the word about their passion, products, and ideas. Did you know that Amy Flurry started her career in the offices of Sassy magazine?! Since those days, she's gone on to contribute to some of the biggest publications in print and online– InStyle, Conde Nast Traveler, Country Living, and Design Sponge– and she served as a contributing editor for Lucky magazine for six years. Along the road to establishing her editorial career, Amy also co-created the Paper-Cut-Project, a creative venture that creates elaborate wigs and silhouettes from plain paper. Her paper creations have been commissioned for window displays and ad campaigns from some of the world's top fashion houses, including Hermes, Kate Spade, Valentino and Cartier. Drawing on her experiences from her editorial career and as a creative entrepreneur with an amazing idea to share, Amy Flurry has written Recipe for Press, an essential guide for folks looking to net their own great press and, therfore, grow their creative businesses. Thursday night's DIY PR Workshop was a great way to folks to hear Amy's tips first hand, and, of course, it gave us all the much coveted chance to "pick the brain" of an editor! 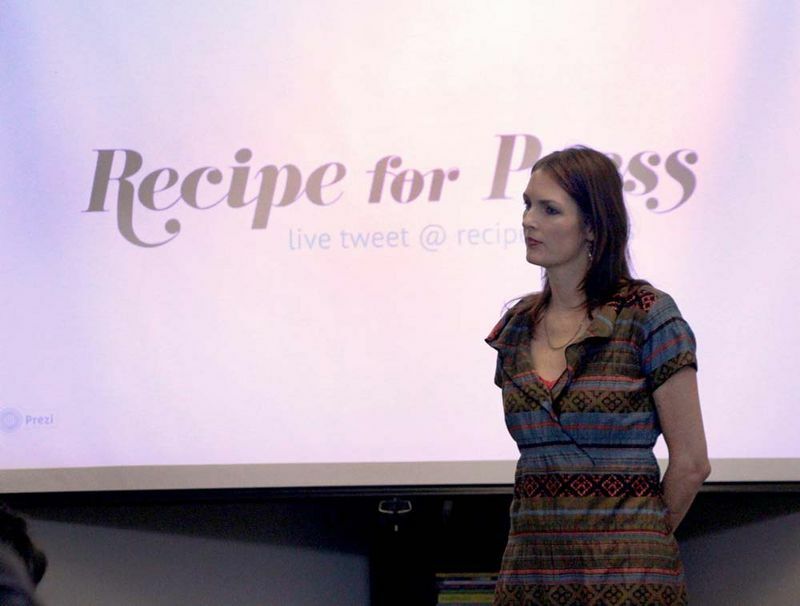 [Read more…] about Amy Flurry leads her DIY PR Workshop in the Greenhouse! Win a seat in Amy Flurry’s DIY PR Workshop in the Greenhouse! We're so excited to have artist, author and publicity expert Amy Flurry in the Spoonflower Greenhouse in Durham, North Carolina, to present her DIY PR Workshop on September 19! We're giving one lucky winner a free spot in Amy's workshop and a signed copy of her comprehensive DIY publicity guide, Recipe for Press! Read on for details about the workshop and your chance to win! If you have a great idea, story, or product to share with the world, this workshop is for you! Please join us in the Spoonflower Greenhouse at our Durham, NC headquarters as Amy Flurry shares her insider tips for getting great press in her DIY PR Workshop on Thursday, September 19, from 6-8pm. Amy's literally written the book on getting quality media attention and creating relationships with journalists and bloggers. Amy's workshops and lectures offer entrepreneurs tips and tools for refining their message, and she can tell you exactly what you need (and what you do not need!) for engaging an audience and maintaining relationships with folks who can help spread the word about your work and your passion. Head over to Amy's website to register for our DIY PR Workshop in the Greenhouse. For one lucky winner, we'll cover registration and include a signed copy of Recipe for Press! Enter between now and Monday, September 2, at 5pm EST for your chance to win!